Gardeners in Louisiana can grow a variety of ground covers that will thrive in the hot, humid summer conditions experienced throughout the state. Ground covers offer several benefits, such as reducing lawn maintenance, controlling erosion on slopes and reducing weeds. These low-growing plants also add texture and color to unattractive areas of the yard or heavily shaded areas where other plants may not grow. Hedera helix, commonly known as English ivy, quickly spreads over the ground and climbs up nearby walls or fences by use of aerial roots. This evergreen vine grows 3 inches tall and features lobed leaves that may appear heart-shaped, fanned or curly, depending on the variety. Pale green veins run through the thick, leathery, dull green leaves and mature plants may produce inconspicuous flowers. English ivy will thrive in full shade in Louisiana gardens and prefers watering once a week. When planting, space plants 2 feet apart and amend the soil with organic matter. 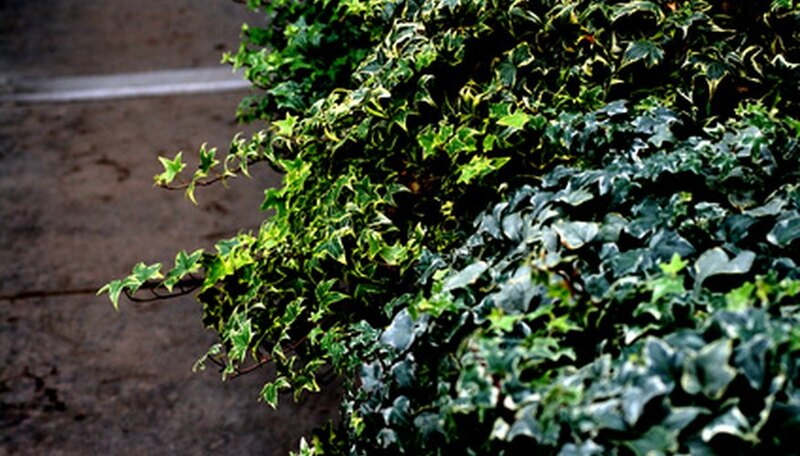 Feed English ivy with a fertilizer high in nitrogen twice a year, once in spring and again in summer. Trim this fast-growing ivy back two or three times per year to keep the area looking neat and to prevent rodents from nesting in the foliage. The upright branches of Japanese ardisia, or Ardisia japonica, reach up to 12 inches tall and bear bright green, leathery leaves at the tips. In fall, clusters of two to six pinkish white flowers bloom, followed by round, bright red fruits that persist into winter. Plant Japanese ardisia in partial to full shade and provide water during dry periods so that the soil does not completely dry out. The evergreen perennial Aspidistra elatior, or cast-iron plant, grows between 2 and 3 feet tall. The dark green leaves reach lengths of 2 feet and arch from the end of 6- to 8-inch long leaf stalks. In the spring, purplish brown, inconspicuous flowers bloom near ground level. This tough, low-maintenance plant tolerates dry, nutrient-poor soil and only requires water when the surrounding soil has dried out. Planting cast-iron plant in full sun will scorch the leaves but it grows well in heavy shade. Under the right conditions, cast-iron plant does not require feeding, but will thrive if given light applications of a balanced fertilizer in spring and summer. Liriope muscari, commonly known as big blue liriope, reaches 1 to 2 feet tall. The arching, grass-like, dark green leaves grow up to 2 feet long but remain less than an inch wide. Spikes bearing clusters of violet, pink or white flowers extend above the foliage in the summer. This clump-forming perennial grows best in partial to full shade and performs well when planted under trees. Big blue liriope requires regular water but does not need fertilizing. Although this ground cover is evergreen in Louisiana, the foliage begins to look ragged in winter months and will benefit from being cut back to the ground before new growth appears in early spring.